Many health conditions in dairy cows are caused by a level of production that’s inconsistent with nutrient intake and understanding the cow’s rumen function is key to preventing this according to Nigel Storer of Bio-Energy Ingredients. These conditions include ketosis, SARA, mastitis, lameness, displaced abomasum, metritis/endometritis, retained foetal membranes, fatty liver syndrome and a range of secondary infections resulting from any of the above. “It’s well documented, and broadly accepted, that cows that are in a negative energy balance in early lactation, or suffering from either clinical or sub-clinical hypocalcaemia, will have reduced immune function and go through this transition period poorly,” says Nigel. “By providing better nutrition, a significant improvement can be made to herd health with major financial benefits - not just treatment savings - but with animal performance and longevity. “To achieve this, we have to look at the needs of the cow. We mustn’t just focus on the energy that we provide – we must look at how much of that energy the cow is able to utilise. That’s the approach that I believe will make significant improvement in an animals’ health and performance. “This requires an understanding of how the rumen functions and how that relates to health. As ruminants, dairy cows require a large component of fibre from the forage in their diet. High-yielding dairy cows require nutrient-dense diets and so are fed more concentrates and less forage. This can lead to a build-up of volatile fatty acids (VFAs) in the rumen which, if occurring for prolonged periods each day, causes sub-acute ruminal acidosis (SARA) or, in extreme cases, full-blown acidosis. This is a particular problem immediately post calving when the cow is switched from a high forage diet to a starchy production diet, as the rumen microbes and papillae need time to adapt to the change. “Maintaining a favourable rumen pH is therefore a major challenge. When ruminal pH falls below 6, fibre digestion declines dramatically making this need for efficient rumen function even more necessary. “A 20% decline in ruminal fibre degradation results in an approximate 10% reduction in feed value in terms of energy and protein, which has huge implications for physical and financial performance. So, to ensure efficient fibre digestion, farmers and nutritionists must work to maintain optimum pH levels. “It’s important to understand the full implications of a low rumen pH – it not only affects rumen fermentation and depresses dry matter intakes, but also increases the maintenance energy requirements of the rumen bacteria. Basically, the energy in the ration is not available for the cow until the rumen microbes have taken what they need. You’re feeding the bacteria first and the cow plays second fiddle, resulting in the energy gap,” explains Nigel. “Clearly, the focus here needs to be on maintaining the rumen pH – this will lead to the diet providing effective energy i.e. energy that the cow can use for health and production. 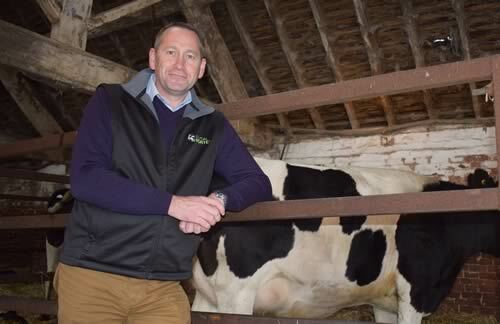 Nigel urges dairy producers to consider adding Glycal Forte to their rations. It’s a source of by-pass energy, a rumen pH regulator and a source of bio-available calcium, making it a very effective ingredient for maintaining pH, allowing the cow to utilise the energy fed and improving health at the same time. “The improvements in the immune system, the reduction in metabolic disorders, and better fertility efficiency, all result from the cows spending less time in a negative energy balance. “Approximately 0.5MJ/kg DM can be recovered from the feed ingredients if the rumen pH is well managed. For a cow consuming 24 kg DM/day this is an extra 12 MJ/day. “It can’t be stressed enough the positive implications of managing rumen pH. Health and welfare are at the root of herd performance and profitability and, as we go forward as an industry, we must revisit how we manage our herds and feed only what is most effective. “The current use of antibiotics in the national dairy herd is no longer acceptable. More than 60% of all antibiotic drug use in dairy herds occurs in the first 60 days of lactation, so this is an obvious point of the lactation to look at closely. “What better way to tackle this problem, than by feeding the cow more effectively and reducing the risk of the level of health problems currently experienced. Let’s focus on keeping the immune system strong, which will result in a reduced need for, and subsequent cost, of treatments,” he concludes.